Surjit Atwal took over as First Team Manager on Saturdays and what an impact he made, although short lived…we were top of Kent County League Division 3 West for most of the season and only lost 1 league game till mid February (6 months). The season then took a disastrous turn as complacency crept in. From the second half of the season we collected just 1 point (from 10 games). In the end this turned into a forgettable season. Promotion was missed by a long way and we ended mid-table. On a better note at the Gravesend Khalsa Football Federation (KFF) Tournament the club set yet another record and became the first and only club to have seeded sides in all 4 major divisions at one time, which is a great indication of the talent and depth we had within the club at that time. In the Gravesend Tournament that year another great success story for the club unfolded as we reached numerous finals including winning the First Division (B Section), Under 16's and Under 10's Titles and coming Runners Up in the Premier Division (A Section) and the Under 14's Section, another fete which a club whilst staging a home KFF Tournament will probably never reach. The Premier Division defeat was hard to stomach for players and management (Narinder Gill and assistant Micky Helaith) as we had lead 2-0 through 2 Jaswinder Bhens (Beano) goals both headers against Smethwick . A deadly Steve Portway (Semi Pro, legend for Gravesend & Northfleet FC and also all time non league top scorer at the time) who hit the post which would have put us 3-0 up had partnered Bhens up front throughout the tournament. Smethwick snatched victory from us to go on and win 3-2, at the time it would have been the first ever A and B section win by the same club, how close we were….this proved to be the last time Gravesend hosted a KFF Tournament for some years. In earlier rounds we had beat both Derby teams GAD (2-1), Punjab (2-0 including a Jess Gill goal direct from a corner) and in the Semi we beat Singh Sabha Hounslow on penalties after a 0-0 draw. This was also the first time we deployed a 5-3-2 formation as finally we started to play wing backs. Harminder Ahluwalia and Baldeep Sahota were our stand out players at this tournament. Also that summer the KFF invited Guru's to take a KFF representative XI to Bedford Tournament to play in a charity show piece match against a team formed by the Royal Air Force. We won the match rather easily 9-1. It was another bad season for the Saturday First Team, we just avoided relegation. Surjit Atwal had quit after 1 season in charge and we were pretty much manager-less until half way through the season, Hardip Gill then took over. We did manage to make the Gordon Charity Cup Final but lost 4-1 to Lanes End in front of a packed crowd at AEI Ground, Balbir Biela with the consolation. However, the Sunday First Team had a great season and was unlucky to finish with 2 Runners Up medals. Managed by Narinder Gill and Assistant Jess Gill we finished Runners Up in the League, our highest ever finish, and only missed out by 1 point to Welsh Tavern. It came down to the last 2 games of the season. We beat The Sun 2-0 with goals from Jess Gill and Boota Singh (scored with a memorable goal as he carried the ball all the way from our half to theirs), but Welsh won too the following week. In the Kent Cup we reached the Quarter Finals and had to travel to Ramsgate to be beaten 2-0 by Hotel De Ville - a young Gadget Dale made his debut that day. We also reached the Reporter Cup Final again (5th appearance) by beating Old Comrades 2-1 in the Semis courtesy of goals by Boota Singh and Balbir Biela, but were outplayed by Shorne FC in the final @ The Fleet, who beat us 4-0. This was the year we spanked our fiercest rivals GSA Erith (managed by a Guru's former player Cooksie Nijjer) 6-1 at Birmingham 's KFF tournament. We started the tournament with a 4-3 after extra time win against the much fancied home side Mahal Warriors Birmingham. 2 goals a piece from Jess Gill and Balbir Biela saw them off. In the second round we won 4-1 against Apna Southall goals from Jess Gill, Jugjit Sian, Jaspal Thind and Jaswinder Bhens saw us through. The stage was now set for the Semi Final showdown with GSA. GSA were favourites going into this game as a packed crowd watched this one with anticipated excitement.....the Guru's did not disappoint. Our non-Asian Wayne Darshmoses was at his best in this game and banged in a hat-trick including an overhead kick. Jess Gill, Balbir Biela and Jigjit Sian added the other 3 goals…..GURUS 6 GSA 1. The Final was a bit of an anti-climax for us and we were beaten by Bradford 4-1, Jagjot Tiwana got the consolation goal. Also that summer in aid of charity we were invited to a Tournament in Gillingham Involving mainly Kent teams we worked our way through the group stages to the knockout rounds. We managed to win the cup after a fiercely fought Final with Fleetdown United (of higher Kent County Division 1). The scores remained 0-0 till after extra time, we won on penalties to lift The Charity Cup. The winning penalty was scored by Happy Mudahar with a cheeky Pirlo chip type penalty. In the group stages we drew 2-2 versus a Gillingham based team - Jess Gill and Balbir Beila with the goals. We also beat The Kent Police with Jag Tiwana scoring in a 1-0 win. We beat Brother Union 3-0 with Jag Tiwana, Jess Gill and Gurdeep Jutte scoring. We also drew 1-1 with GNG Gillingham with Scottie Bhens scoring. Jaswinder Bhens and Surjit Atwal picked up North Kent Sunday League Long Service Awards from the League. North Kent Sunday Senior Cup Winners is what this season will be remembered for. In the First Round we beat Welsh Tavern Reserves 3-1 after extra time - Balbir Biela 2, Daljit Rana. In the Second Round we beat Cobham Sunday 4-3 – Balbir Biela 2, Baldip Sahota, Kam Khunkhun. In the Quarter Finals we beat Welsh Tavern 1-0 – Luke Slatford. In the Semi Finals we beat The Sun 2-1 – Jess Gill 2. And in the Final we thumped Kings Farm Sunday 3-0 – Jess Gill (penalty), Jaswinder Bhens and Gurdeep Jutte got the all important goals. This was our third ever Senior Cup Final appearance and the second time we were lifting the cup. Skipper Balbir Biela lifted the cup in front of a massive attendance. With the Senior side not performing well in the summer KFF tournaments it was the B Team managed by Dara Chauhan that left their mark at Leicester . We had beaten both GAD Khalsa and Punjab Derby in the first 2 rounds, but what made the tournament so memorable was that we beat both home Leicester teams in the Semi and Final in front of packed crowds, so packed that the B Final overshadowed the A Section Final, as it was so entertaining. In the Semi we disposed of Khalsa Leicester 3-1, Michael Underwood (this kid was special) scoring a superb hat-trick. In the Final we beat GNG Leicester 4-3 after extra time in a game where we were behind no fewer than 3 times. It was an amazing match, Amarjot Tiwana equalised to make it 1-1, then Hardip Gill made it 2-2 with seconds to go to full time and 3-2 down we made it 3-3 through another Underwood goal. Then in virtually the last move of the game the final was won, Jess Gill got clipped in the box and stepped up to put away the resulting penalty. Bahadur Atwal was our man of the tournament, at 50 years old he played all 4 matches and was terrific throughout. Hardip Gill and Micky Helaith were also our other aged warriors that played all 4 games. The B Team also made the Bradford KFF Final that summer but lost to GAD Khalsa 3-1. After that Final we became No.1 seeds. The Saturday First Team finally started the season with a Manager, Makhan Cheema – with Kam Khunkhun and Jagjot Tiwana assisting him. Mac had seen and had enough over what was going on over the previous seasons and put together a team that won the Kent County Division 3 West Title and with that we were promoted to the 2 nd Division once again. We only conceded 20 goals in 22 games and lost only 2 fixtures, a great season. However, celebrations fell short as the following season the 3 rd Division was abolished and merged with the 2nd Division which somewhat took the shine off of us being promoted. Jagjot Tiwana was awarded Player of the Year. The Sunday Team ended up a respectable third in the table. Narinder Gill after more than a successful decade in charge resigned as manager. Under Mac Cheema we managed to reach another Premier Division KFF Tournament Final, this time at Derby . It was old foe GGS Bradford like 2 years before that unlocked us in the Final though….but what a great Tournament we had. In the First Round we were up against seeded and home team Punjab United Derby in front of a packed home crowd with Nathan Darshmoses amongst the scorers. We were superb and outplayed the hosts to win 2-0. A Michael Underwood hat-trick saw us dispose of GNST Wolverhampton in the Quarters after Kam Khunkhun had opened the scoring, final score 4-2. In the Semi's we beat Azaad Wolverhampton 2-1 with goals from Balbir Biela and Lucky Samrai. We ended up 4th seeds at the end of the KFF season and qualified for an all expenses paid SASA organised Scotland Tournament where we went out after 2 losses and a draw in the group stages. The Final was played at Rangers home stadium Ibrox. Makhan Cheema resigned 2 games into the Saturday First Team season (due to family commitments) and we were left pretty much manager-less again until volunteer Ranjit Rama took over half way through the season. We were now playing our football in Kent County Division 2 East. We ended up just above the relegation spaces - Rama done well to step in and save the team from relegation. New manager Kin Biela took over the Sunday First Team and we just avoided relegation – highlight of the season was reaching the Senior Cup Semi's where we were beaten on penalties by Old Comrades after a very entertaining 3-3 draw after extra time. We formed a new Reserve side on Sundays. So now we had 2 Senior Teams on both days. Official KFF tournaments did not take place, first time in a long time. And also for the first time in a long time Guru's left a season empty handed, no trophies what so ever. The Saturday First Team was relegated after a disastrous season. Player's commitment and desire was questioned, Ranjit Rama (also I think ex players Narinder Thandi and Sarge Bungar managed the team for a brief spell in this season) tried his best but the players except for a certain few let him down. Rama resigned and the committee threatened a new era…..if our boys were not up for the fight or did not have the desire to play on Saturdays then a new English manager and players would be drafted in. Kin Biela and Assistant John Gill in their second season in charge arguably had the most successful season the club has ever seen on a Sunday. We ended up 4th in the league but it was the cup runs that caused a sensation. Firstly the North Kent Sunday Senior Cup….In the First Round we beat Milton & Denton 4-0 – Raghbir Chauhan, Michael Harris and Daljit Rana scored. In the Second Round we beat New Ash Green Reserves with Daljit Rana scoring. In the Quarter Final we beat Hollisters on penalties after a bore 0-0 draw. In the Semi Final we beat New Ash Green with Boota Singh and Marco Pescatore scoring. We met The Sun in our fourth ever Senior Cup Final appearance. After being outplayed for most of the game we were 2-0 down, we came back though with goals by Ricky Gosal and sub Raghbir Chauhan to make it 2-2. In extra time Boota Singh ran half the pitch and scored a great goal to make it 3-2 to us with minutes remaining….but The Sun never give up and Frankie Whitehead back-heeled in the equaliser with the last kick of the game. We were undone on penalties in one of the greatest Senior Cup finals ever. But it was onwards and upwards as we had another final to look forward to….The Reporter Cup Final against old enemy GSA Erith to be played at Gravesend & Northfleet FC, Stonebridge Road . The Reporter paper called it “The Battle of Stonebridge Road.” This would be our 6 th appearance in a Reporter Cup Final but we had still only won the cup once back in 1982…..things were about to change. In the Third round (Senior Division sides enter the cup at this stage, bit like the FA Cup to give the lower division sides a chance to progress) we beat The Grapes 3-1 after extra time in a replayed tie – Michael Harris 2, Daljit Rana scored. In the Fourth Round we beat Springvale 2-0 – Jess Gill and Harpreet Mudahar scored. In the Quarters we beat Real Gima 2-1 after being behind, two great strikes by Perminder Bains and Jagjot Tiwana. In the Semis we trounced Swanscombe Sun 7-2 – M.Harris, R.Gosal 2, K.Khunkhun, P.Bains, R.Chauhan and H.Mudahar scored. So to the Final against arch rivals GSA who beat The Sun in their Semi Final. We drew first blood when Jagjot Tiwana scored with a long range effort, 1-0 at half time. A costly error at the back drew the game level. But with minutes to go golden boy Balbir Biela scored the all important winner after a well worked set piece corner, we had beaten GSA Erith all over again, and yet they had waited so long for revenge from 4 years earlier. Our second Reporter Cup win 24 years after the first, ironically against a team managed by Cooksie Nijjer a former player who played in our first ever Reporter Cup winning team back in 1982! Captain Kam Khunkhun lifted the cup aloft in front of a record North Kent Sunday League attendance for a Reporter Cup Final, victory had never been so sweet. The highlight of the KFF Tournaments was reaching the Semi Final at Hounslow Tournament after which we were awarded with a seeding (4th) for the following tournament. We caused a shock by beating the number 1 seeds GGS Bradford 2-1 in the First Round with Rashpal (Scottie) Bhens, son of legend Beano and Ross Toulson scoring. Also in the summer a 5-a-side Tournament was held at AEI Gravesend in memory of a former junior player of ours, Jason Gill. Jason was a terrific lad and will be sorely missed. His dad George Gill (of Ace of Clubs FC) held this Tournament. And it was fitting to see it was actually Guru's who won the Tournament, something Jason would have been happy to be part of and dad George also was happy to see when he presented the trophy to Player Manager Jess Gill who lifted the Trophy. We had beat Old Comrades, Craggs Farm and Gravesend Utd along the way. Raghbir Chauhan was top scorer for us. The Saturday First Team had to re-apply for status in Kent County Division 2 East, fortunately we were granted a league spot back with the other League members voting us back in. The Guru's committee had finally done what they threatened to do if results and effort did not improve. Les Harpley (ex-manager for years at Greenways FC) was given the Management job alongside Assistant Micky Helaith (also chairman of Guru's), our first ever English manager and a haul of 5/6 English players were drafted in. These players mixed in with our good 9/10 committed players have become the First Team Squad. With the introduction of our new structure we want Guru Nanak FC to aim towards Semi-Professional status, the dream may be a few years away but we have made enormous progress. We won Division 2 comfortably by a clear 6 points scoring 80+ goals along the way. Daniel Jeffrey was second top scorer in the League and contributed 30 goals, he was awarded Manager's Player of the Year while Ryan Robinson was awarded Player's Player of the Year. The Saturday Reserves ended up bottom of Gravesend League Division 1 forfeiting 4 games during the season because they did not have enough players to field a team. The Sunday First Team (now under the guidance of new Manager Hardip Gill and Assistant Kam Khunkhun) form in the league had been poor and we were fortunate to avoid relegation but cup form once again was good. As reigning champions of the Reporter Cup we once again reached the Final. This was our 7th appearance in a Reporter Cup Final. We seemed to have formed a love affair with this cup of late as it was our 4th Final in the last 8 seasons. We had beaten two lower division sides in Round 3 and 4. In The Quarter Finals we came up against Senior Division Swanscombe Tigers who we beat 3-2 with a Michael Harris hatrick. In the Semi Final we beat Hollisters of the Senior Division 3-1 with Jelal Mohsini getting a brace and Scottie Bhens getting the other. Scottie Bhens also gave us the lead in the Final versus New Ash Green of the Senior Division. The venue for the Final had been moved from Stonebridge Road to Corinthians FC. New Ash Green equalised after half time. Gurus missed a penalty at the death and the game went into extra time. New Ash Green secured a 2-1 victory after our keeper blundered, just was not to be our year this time. Moin Karim picked up the Player of the Year Award. The Sunday Reserves managed by Dara Chauhan and Assistant Jaspal Goraya won promotion to North Kent Sunday League Division 3. They ended up Runners Up of Division 4 with Hardev Dale scoring 29 goals and getting the Player of the Year Award. In the Reporter Cup they had some memorable giant killing victories against Senior Division sides beating Top House and Swanscombe Tigers along the way. They made headlines on each occasion in the local papers. It had been 6 years since we hosted a KFF Tournament in Gravesend, but our application on this occasion was successful. The Gravesend Official KFF Tournament took place on the weekend of 26th and 27th of May 2007. We managed to secure a record 9th Gravesend A Section win under new Management Team Les Harpley and Micky Helaith, our first top Division win since 1993. In the First Round we beat Sikh Hunters Walsall 2-1 with new signing Craig Gillam scoring both goals. In the Quarter Final we beat GNP Coventry after being behind 2-0. Daljit Rana scored a penalty and Daniel Jeffrey made it 2-2. GNP Coventry was then disqualified for impeding the non asian rule. In the Semi Final we thrashed Punjab United Wolverhampton 3-0 with goals from Daniel, Daljit and Bilhar Dosanjh. The Final was a classic against Singh Sabha Hounslow. We went 1-0 up through Craig. Then conceded with 10 minutes to go, extra time came next. We shot into a 3-1 interval lead with goals from Daljit Rana and Amarjot Tiwana. But it was one of those games where everything happened and we conceded twice, the score now 3-3. In virtually the last minute Randeep Sabharwal stepped up to half volley home the winner, what a 4-3 victory! – it will be talked about for years to come! For a full tournament report check the Tournament Archive section of the website. We also managed to make the Semi Finals at Leicester. 2 tournaments (Derby and Birmingham) were wiped out due to floods, and we ended up 2nd in the 2007 KFF League table – very controversial that we were not top! However, we qualified for Scotland Tournament but declined the chance to go to concentrate on our League schedule. Player of the Tournaments was awarded to Craig Gillam. The Saturday First Team were playing in Kent County Division 1 East, this now at an Intermediate level - the highest level of football we have ever played in. And we had adapted wonderfully well under the guidance of Manager Les Harpley and Assistant Micky Helaith who were in charge for their second season together. We were flying in the first half of the season and recorded 8 wins out of 8 in all competitions and were sitting pretty at the top of the league in early December. But the second half of the season was a shambles, we only managed 3 more wins and ended up 5th in the table. It was never quite worked out why players lost their hunger after such a good start, but lack of training turnouts did set about in the winter and Gurus paid the price in the end. John Mee ended up top scorer with 10 goals. The Saturday Reserves were still playing in Gravesend League Division 1. They were now run by new manager Jaz Cheema. Jaz had been running the team a lot better than it had been run in previous seasons and seemed to be getting out the numbers with ease for once. This proved to be one of the most successful Reserve season's ever for the Gurus as we secured the treble. We won the League just pipping Swan Valley on the last day of the season on goal difference, this also gave us promotion. Lost only 3 games all season and scored over 70 games in 18 games. William Friend was top scorer with over 30 goals. We won The League Cup 'A' beating 2 Premier teams to get to the Final. In the Final we played the much fancied Lullingstone Castle of the Premier Division. We beat them in a penalty shootout 3-2. The score after extra time was 2-2, William Friend scoring both goals. We also won The Presidents Cup once again by overcoming Premier teams. In the Final we beat Premier Division side Ace of Clubs 2-0 with Hardev Dale and Mardip Bagri scoring the goals. It completed a remarkable first season for Jaz Cheema, now the Premier Division awaits them in 2008-09. The Sunday First Team was still run by Hardip Gill, now in his second season. We were still struggling to cope in the North Kent Sunday Senior Division and it was another season in a relegation dogfight. We just managed to avoid relegation in the end by goal difference. We got knocked out in the Quarter Final stage of The Reporter Cup by The Sun 2-1, at one stage we lead 1-0 and then missed a penalty. Surprisingly we beat The Sun and A&Z Sports in the league who finished 1st and 2nd, that was the highlight of our season. Michael Harris finished top scorer for his third season in a row. The Sunday Reserves managed by Dara Chauhan were coping well early on in the season but then started to lose a few points. Dara resigned as manager midway through, a combination of Perminder Bains, Gadget & Vik Dale saw the season through. Ended up 6th in the League and had to forfeit 3 games. After this season it was seen to terminate this side for good, so no more Sunday Reserves. The KFF Tournaments were upon us once again and there was a certain amount of expectancy in the air as KFF's No.1 team in 2007. Controversially the KFF decided not to grant us a home tournament. Les stepped down as Manager as he wanted to concentrate solely on the domestic season, so in stepped his assistant Mick Helaith and new Assistant Nathan Cheema. The expectations were soon blown apart though as the first 3 tournaments saw us win only 1 game. So we failed at Walsall, Hounslow and Leicester. Derby, however, proved to be our best tournament. The Derby Tournament was played on the weekend of 12th and 13th July at Moor Park Sinfin. In the first round we played Punjab United Derby, the home team and number 2 seeds, who had already won both Walsall and Leicester Tournaments. We were heavy underdogs but did not disappoint our army of supporters as we recorded a 3-2 win. Skipper Kam Khunkhun scored with a header, Craig Gillam scored a cracking volley from 30 yards out whilst 16 year old Raj Salhotra scored the winner with ten minutes to go with the score at 2-2, a delightful chip over the Derby keeper. We had caused the first but not last shock of the tournament. In the Quarter Finals we played Sporting Khalsa Walsall who we beat 2-0 confortabvly with goals from Craig Gillam who lobbed the keeper, and then Craig teed up Raghbir Chauhan for the second goal. In the Semi Finals we were to face local and fierce rivals GSA Erith, 3rd seeds, in a repeat of a Semi Final clash of 6 years ago where we beat them so easily 6-1. However, this time GSA as favourites to win the game we did not have things our own way as we went 1-0 down. After that Guru's dominated the game and equalised through a top quality strike from outside the box by Gurdeep Jutte. GSA held on for a penalty shootout with 10 men as Guru's missed chance after chance. In the shootout Guru's advanced 4-3 with our goalkeeper Sunny Hayre aged just 15 saving two penalties. Raghbir scored the winning penalty to hand us a much deserved and satisfying win. In the Final we lost out to Smethwick Sports FC after leading 2-0, the goals included a great mazy run by Bilhar Dosanjh finished off by sidestepping the keeper and stroking home and another Craig Gillam volley from outside the box. In the end it was a bridge too far for our lads as injuries and fatigue played a part in our downfall. Smethwick were worthy 6-2 winners in the end. Another 2-0 lead loss to Smethwick like the Gravesend Final a few years back. At Birmingham we lost in the First Round to Sporting Khalsa Walsall a team that had never defeated us before. A disappointing end to the KFF season after we had seemed to turn the corner at Derby, in tournaments an average season is when you win more games than you lose, a really good season is when you double the amount of defeats with the amount of wins, 4 wins and 5 losses is unacceptable - the only good thing was we beat arch rivals GSA all over again. It was in this season we had players become Bollywood Stars in a smash hit film made in 2007 called Dhan Dhana Dhan Goal‏ - Starring Bollywood heart throb John Abraham and the beautiful Bhipashu Basu....Gurus make it to Bollywood!! The film was set in Southall and obviously as the title suggests was about football. Amongst others Gurus players Amarjot Tiwana and Gadget Dale landed roles in the film as footballers. This opportunity to act for our lads came about in a strange way - some Gurus Members were out in Bombay celebrating the 40th birthday of Narinder Gill.....whilst staying at the Marriott we came across John Abraham who was filming for MTV. After a brief chat with him we discovered he was going to shoot a film about football in London Studios and needed good looking Asian footballers in the film.....the rest is history. The Saturday First Team were playing their second season in Kent County Division 1 East. Les Harpley was now managing the team for his third season but Micky Helaith was no longer Assistant, so in came Parm Sangha. We had a reasonable start to the season only losing 3 games in our first 10 fixtures. Up until end of January we were still holding our own in the division, winning one week, losing one week, constistency being the problem. Consistency also lacked in turnouts, and squad faces were changing all the time. Some under 18's were drafted in from the youth section. Training turnouts were appauling and in the end there was no training just matchday games. We then lost 9 of our next 10 fixtures including a Quarter Final defeat. We were then reduced to playing in a relegation scrap, which we just survived by picking up 7 points from our last 3 fixtures. On the final day of the season we had to beat Kennington away, 2 goals from Jelal Mohsini were the difference. A disastrous season that could have been worse with the shame of relegation. Players were in and out all season, bar the usual 4 or 5. Home games we would have a different 11 to away games, proving players were not travelling well. Even Assistant Parm resigned halfway through the season and it was left to mainly Dominic Hewitt and Jess Gill to help Les out. Also for the first time since we've been in the Kent League we had to cancel a game due to lack of players, we were docked a point for that and fined by the League. Next season we have pushed across to Division 1 West for geographical reasons, meaning our away games will be closer to travel to. The Saturday Reserves had now been promoted and were playing in The Gravesend Premier Division. The season lasted just 10 games, poor turnouts, not enough players, we were folded by Christmas. So 2 seasons ago we had 4 senior teams over Saturdays and Sundays, and now we were down to 2. Jaz Cheema tried his best as manager and even Nathan Cheema tried his best to keep the team going but it wasn't to be, and this all after probably The Reserves best ever season after securing a treble last season. 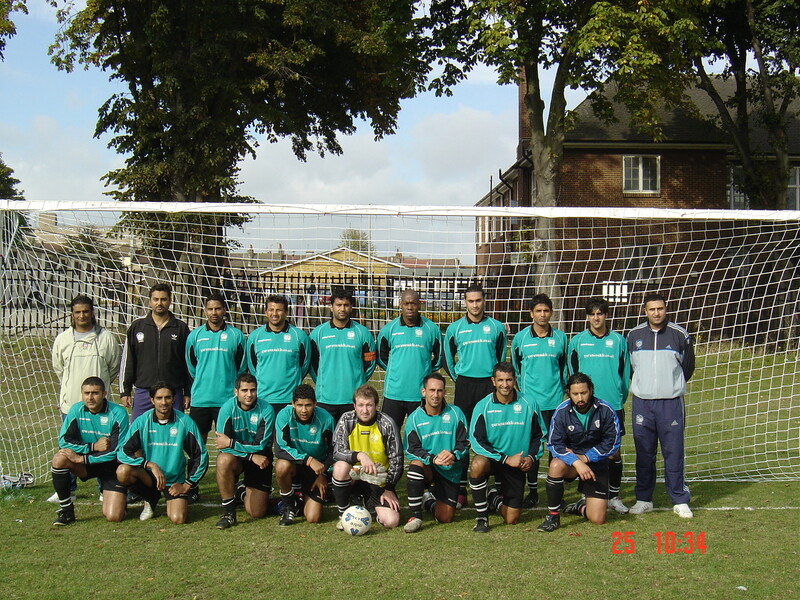 The Sunday First Team was now managed by Kam Khunkhun and Assistants Jaz Cheema and Kin Beila. Hardip Gill had stepped down. We had a terrible start to the season and it wasn't until the end of October we registered our first win, ironically as always against The Sun 1-0 (later confirmed League Champs again). We lost 11 league games on the trot in one spell, and even our normal Reporter Cup run came to an end to a First Division team. With that sort of form it was no doubt we finished bottom and ended up relegated. Kin resigned as Assistant half way through and Micky Helaith came in. We beat the Old Comrades 1-0 in the final game, one win too late. Kam managed to get a good turnout for games week in week out, sometimes even a squad of 18, but the quality of play just was'nt there. Michael Harris still banged in the goals though - 13 in total, top scorer for the 4th season running. Division 1 awaits us next season. So a disaster season all round for the Senior's. Players commitment and playing ability were just not good enough bar the 3 or 4 players. Players didn't train, and when they did not enough trained or not nearly as hard enough. Both the Senior and Youth teams were pulled out of the KFF Tournaments as we made a stand as a multicultural club, KFF had become an Asian only affair....something we did not want to be associated with at all. We offer the opportunity to all kids to play for us regardless of race, nationality or faith. For the first time ever we were not representing at the Khalsa Football Federation Tournaments. So what forth for the Senior Section of Guru Nanak FC.....anything has got to be better than the season just reported upon, one of, if not our worst season ever! The Saturday First Team were playing their football in Kent County Division 1 West. Les Harpley was still managing the team for his fourth season with Mick Helaith still as his Assistant. We started the campaign well enough picking up 4 points from our first 2 games without conceding a goal. But just like last season the commitment of players and training attitudes were bad, and before you knew it we lost the next 6 games, Les resigned after this, ironically his last game in charge was against his old team Greenways, that day we squandered a 3-1 lead to lose 4-3. Les had grown tired of the sitaution we were in and the players response, it was a shame to lose him as he had a good few seasons with us - the most memorable his first, winning the league and Gravesend KFF Tournament. Mick Helaith then took over for the next game and through no fault of his we were thrashed 6-1. Once again the first team was in a proper ugly situation. One manager had walked, and the assistant was left to hold the reigns. Jess Gill then stepped in as Assistant just like last season to help out. Although we won our first game v top of the table Metrogas 2-1, we never recovered from the state the team was left in, we went out in the cup in the Quarter Finals and we ended up second to bottom in the league, relegated. The Sunday First Team was still managed by Kam Khunkhun for his second season in charge and two new Assistants Serg Atwal and player Jag Tiwana. Kam was determined to put last season behind us and get us back to where we belong, in the top division. We were now playing our football in North Kent Sunday League Division 1. We started the season on a high winning 3-0 in our first fixture, however we were defeated in our second fixture 3-2. Our tag of league favourites was diminished after that game, but then we went on a run of 6 straight wins, Hardev Dale scored all 4 goals in one game as we defeated Swanscombe Tiger Reserves 4-3. Longfield were also flying high and we drew 0-0 with them in both games. It always going to be a fight between us and Longfield for the title after Christmas and Longfield just edged it winning the league by 3 points. Our record was played 16, won 12, drew 3, and lost only one back in September. So promotion was gained at first time of asking, great effort by players and management. Hardev ended top scorer with 13 goals, Ricky Mann new signing chipped in with 8 goals and Dave Gosal was awarded Player of the Year. We were ever so unlucky in the Reporter Cup too, we just missed out in a place in the Final, beaten 2-1 in the Semi in controversial circumstances by Premier Team and eventual winners of cup Gravesend Spartans. As for the KFF, we omitted our teams once again - as we were sticking to our principles of kicking Racism out of football. KFF tournaments were still an all Asian affair, something we did not want to be stained with, as we are still a Multicultural Club.....and always will be. In April the Under 16's reached the Kent Cup Final.....a massive day for us. I have included the whole match report. The day started with an early visit to the new Temple in Gravesend for a blessing, a Guru Nanak tradition, which all the boys attended. On arrival at the ground the mood was relaxed and jovial. The boys walked the pitch at Faversham FC which was hard and bumpy. Nigel set up the warm-up routine which went to plan, although the boys seemed to be a bit on edge which was understandable with such a big game for both the team and the club ahead. By the time kick off came the crowd had begun to swell which seemed to be mostly Guru supporters. Just before we left the changing room, Nigel donned a pair of bright red Ronald McDonald shoes and explained to the boys that last time he played here he scored a hat-trick in these shoes, the boys loved it and it settled their nerves. The game started well for Gurus with the lads settling into their football immediately with the early exchanges belonging to Guru. George Beadle won a corner on the left hand side, 15 minutes into the game. Sam Beale knocked in a superb cross which was met by Tom Cackett who headed it beyond the Dartford keeper, 1-0. Dartford responded but our midfield of Tom, Reece, Lofty and Oscar dominated, winning tackle after tackle. In the 25th minute Oscar broke down the right, mesmerising the defender with several step-overs cutting inside, sending the ball over the bar. Gurus continued to battle and control the ball from front to back with Billy and Jimmy totally controlling the back line. The team grew in stature as they slowly bossed the game with Tom and Reece working their socks off to create chances. Gurus were the underdogs today but it was a one sided affair with our keeper only saving one or two hapless shots. Some excellent one touch football saw us open up the Dartford back four time and time again. The only thing missing was another goal. With half time approaching Lofty, Sam and George combined brilliantly on the left to open up the Dartford back four, but the finish was wayward. Gurus half, could we play the same football in the second half? The game started for the second 40 minutes with Gurus carrying on as they had left off, attacking Dartford with wave after wave of attacks with no joy, until 10 minutes into the half when an excellent move resulted in a superb block by a Dartford defender which broke to Lofty in the box who jinked and turned the defender in-side-out, he stuck out a leg and sent Lofty tumbling over (Penalty), no doubts. Up stepped Sam Beale, left footed, never missed this year, slotted it into the right-hand corner, cool as you like, 2-0. The dream was becoming reality. The only danger we could anticipate was complacency or fatigue against a fit Dartford side, who haven’t been beaten this year. Gurus continued to control the game but gave away a free kick on the edge of the box, the shot came in and Billy French headed it onto the bar, the ball was then lost in the sun and the Dartford centre forward headed it in the far corner, an element of luck but you need luck to win games. This gave Dartford fresh impetus to push for an equaliser but our boys were more than equal all across the park. Some outstanding performances from our boys finally paid off when Tom Cackett, who was a class act today, burst through the midfield and ran at the heart of the Dartford defensive line, who struggled to cope with his direct approach, struck a right foot shot past the out-stretched hand of the Dartford keeper to make it 3-1. The crowd went wild and so did the boys. Game over Dartford, who on their day are a force to be reckoned with, huffed and puffed but some resolute defending kept them at bay until the final whistle. A great game to watch 3-1 to the Gurus and a much deserved result. A great performance by the boys who are maturing into quite an outstanding team. We took the game to a very good Dartford side and beat them convincingly. I hope all those that came and supported us on this big day out will attend many more before we start to charge admission fees to watch! Nigel and I would like to thank both Guru Nanak Football Club and the parents for their dedication and support. I hope this is the first of many memorable games.